When to study specific neighbors? I just had a quick question. I am about to record a list of neighbors of each of my relatives from their census records and was just wondering what your thoughts are on when to look closer into a specific neighbor as a possible relative, or at least, an important enough figure to mention in an ancestor's biography. My initial thought is if they are living in the same building (unless it's an apartment complex) and/or if my ancestor are of the same ethnicity and a seeming minority in the area. This is just a question based on census info. Since my family inter married with neighbors , researching neighbors has been helpful for me. Trudy. I think it is impossible to give a definitive answer to your question because it really is a judgement call based on your knowledge of the specific family, the time period, and the cultural/religious norms they adhered to. If I did have to generalize what I have encountered in my research (mostly Ontario, Canada between 1851 and 1921), I would say the majority of the time all people in a household not identified as servants, domestics, labourers, or lodgers, have been closely related to the person listed as head of houshold: uncles, aunts, siblings, in-laws, parents, children (including adoptions), nieces and nephews, and very rarely, cousins. I think, therefore, that anyone in the same household or family can be mentioned as a research lead unless they are clearly identified as non-family. selected Jun 16, 2014 by Mary H.
That has been my thought throughout my research! I did some checking of census info on an ancestor & discovered that Walt Whitman, the poet, was his neighbor. I always check neighbors now (not just next door neighbors, but neighbors in the general area). I had an ancestor who I couldn't connect with her parents (I knew their initials and last name). I knew I found the right parents because of where they lived and what was written on her marriage license - I just couldn't "prove" it with census reports. My ancestor was born in 1880 after the census was taken. As you probably know, the 1890 census no longer exists and she was married five years after that, which meant there are no census records with her mentioned. How far do you usually go? A page on either side? A few houses above and below? I am just trying to figure out a good rule of thumb. 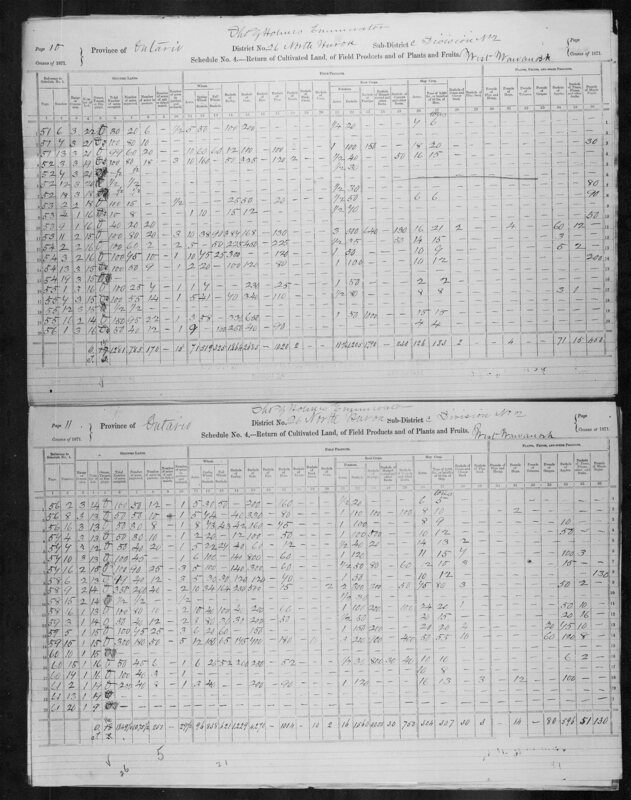 A few families or pages may not be nearly enough... Just to give you an example here is link to two pages from Census of Canada 1871, Schedule 4. The left most two columns make a reference to the page and line number of the personal census (Schedule 1). Columns 3 and 4 indicate the land they occupy. You will notice lines 9 and 10 on the upper page (10) refer to two families enumerated on page 53 who live Con 1 Lot 16; on the lower page (11) lines 16 and 17 are families enumerated on the same lot who appear on page 60. This is 4 families that live on different parts of the exact same 200 acre lot that are enumerated 7 pages apart because that was the route the enumerator happened to take. I think that is very useful! I have bookmarked it for future reference and will definitely be looking into more of her w.ork. Neighbor's children in the census?? When did women start lying about their age? What about Trees for neighbors, friends, etc. who aren't actually related? James Neighbors 1801 NC, help locate his parents and family.